There are many stories woven into the fabric of the Andean culture. It is difficult to know which stories are a pure reflection of the pre-conquest era and which were influenced by the conquerors and their religion. It is also difficult to know to what degree the stories have been shaped by the expectations and desires of those of us from the West who seek to find in the Andes what our own culture lost so many centuries ago. In addition, being an oral tradition, the stories may vary from village to village or from story teller to story teller. Here is a thread of a story pulled from a much richer and more elaborate fabric. The indigenous people of the Andes refer to themselves as the ‘Runakuna’. In Quechua (the language of the Andes) the word ‘runa’ means ‘person’, and the addition of ‘kuna’ to a word makes the word plural. In it narrowest use ‘Runakuna’ refers to those Andeans who are the inheritors of, and who still live, the ancient Andean Cosmovision. In its widest use ‘Runakuna’ refers to the entire human race. We are living in the age of the Runakuna, which is the age of the sun, and we are the children of the sun. Before there was the sun (Taytay Inti) there was the moon (Mamma Killa), and before the Runakuna there were the Machukuna, the children of the moon, the ‘Ancient Ones’ (‘Machu’ is Quechua for ‘ancient’). The Machukuna lived on this earth and the moon was their sun. The age of the Machukuna ended with a ‘pachakuti’. A pachakuti is a time when space, time, and consciousness go through a great change, an overturning of the way things are. In this pachakuti the creative impulse of the living Cosmos created the sun, under whose searing light the Machukuna could not survive. The Machukuna could see their doom approaching with the first dawn. Some fled into the hills to seek shelter in caves, some dove into deep waters, others hid in the trees. They died, the sun killed them all, but their spirits are still around. * Their spirits may be encountered in certain caves, and at night, in a bright moon, their bones are reanimated and walk about the earth. The ‘chullpas’ (small stone dwellings built by the Machukuna) are scattered about the slopes of the Andes. At sunset, when the sun has gone, the Machukuna emerge from their chullpas and warm their bones by the red glow of the evening sky. With the rising of the sun and the fall of the Machukuna the Runakuna appeared and the age of the sun began. Why did the Cosmos create the sun and destroy the Machukuna? Some Andeans believe it was done for the benefit of us, the Runakuna, but many believe the Cosmos did it because it just felt like it. This story has not come to an end. There will be more pachakutis, times of great upheaval and change, leading to new ages and new types of people who will thrive in those times. The Qero, and other Andean, paqos say that we have entered another pachakuti. One of the stories woven about the Qero is that they have abandoned their path of isolation from the West, a path they have followed since the Spanish conquest of Peru, because they have a piece of what humanity needs to make the transformation necessary to move into the next age of the world, that piece is the Andean Cosmovision. 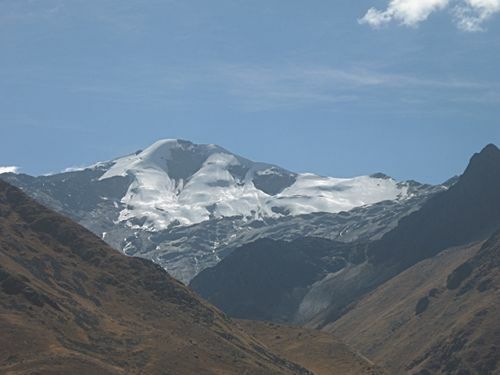 Andean peak on road from Cusco to Bolivia. It used to be covered with snow at this time of year. It makes a nice story, at least I like it. As with many good stories (see The Lord of the Rings) it contains some sadness for things lost. A fuller telling of the tale includes a prophecy that by opening up to the West the Qero may have doomed their own culture. About the pachakuti, we don’t have to be driven by fear of cataclysm, we can also be drawn by love and beauty. In this story if humanity survives it will be by becoming more in touch with all of who we are, all of our facets as beings in this Cosmos. When this happens we will, metaphorically, grow wings and fly. I’d like to end by sharing something don Americo Yabar told me, but I find that I must use my own words and concepts to relate it. In the Andean Cosmovision, as I understand it, there is no God that stands outside of the Cosmos as the creator, nor is the Cosmos simply a collection of energy and matter operating off of mechanical principles. The Cosmos itself is conscious (and sacred), and the creator and the creation are one and the same. ** The Cosmos is ‘thinking’ about the current situation on our planet and soon it will come up with an answer, in the ripening of time. All we need to do is to stay connected with, and in harmony with, the Cosmos as it evolves. The Andean meditations provide a means for doing this. *That the spirits of the Machukuna still live in our world/age/time may be too Western of a way of putting it. In the Andean view of time/place/consciousness when there is an upheaval in the world then the old word/age/time continues to exist but in a timeline that is parallel to our own, less real to us but still able to affect our world. **The gods of the Andean Cosmovision, including the ‘creator god’, are personifications of aspects of the conscious Cosmos itself, rather than separate Beings who reside in and direct the Cosmos. Joan Wilcox (2004), pp 71-73. Catherine Allen (2002), pp 38-40, 46-47. Inge Bolin (1998), pp 22-24.